Football season. It’s a great time of year. The weather’s cooling down and the holidays are right around the corner. But first, it’s time to gather friends and family to cheer on your favorite teams. I love it. And of course, what every good gathering needs is a scrumptious selection of food and drinks. As you may have learned from this previous post, I am a proud former student of Texas A&M. Which means that I’ll be serving up maroon-inspired snacks during the big ‘Bama game this weekend. 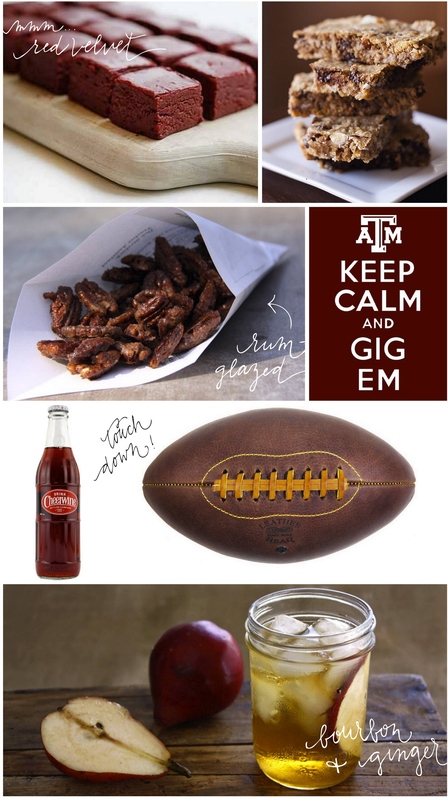 :) While searching for the perfect game day treats, I came across these gems. Since I know many of you are Aggie fans, I wanted to share them with you! What’s your favorite game day treat? Enjoy the beautiful weather & football celebrations this weekend!